We intend to keep the process of growth simple by not having dozens of programs that require people to spend long hours in church meetings. Our biggest event is the Sunday morning worship service. Andrew is an informal, “laid back” kind of church where people don’t have to dress up to attend. The celebration room, or the place we meet for worship is not a sanctuary with tall stained-glass windows or huge organs pipes. The room does not have a big, lofty, wooden pulpit the pastor looks down from as he preaches. There is a stage with altar table, chairs for the choir and instruments, sound equipment and microphones for the worship band. We sing hymns and praise choruses throughout the service to honor God and give him glory. The messages (sermon) are as much teaching as they are preaching. Each week the pastor gives valuable information from the Bible on something that impacts and affects your life. A recent message series was “How To Help a Friend Through Tough Times”. Blended service with both traditional hymns and newer contemporary praise and worship songs. We used to offer two separate services; one of which catered to a traditional audience where we only sang hymns and one in which we sang more modern/ contemporary music (what you could hear on KLOVE Christian radio). We found that this format did not allow our church or it’s members to reach their fullest potential and have incorporated elements of both worship styles into our current Sunday service. We will sing hymns and contemporary music every Sunday as well as perform liturgy when appropriate. 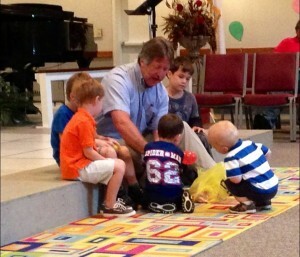 Children’s moment and and hearing the Word from Jimbo! Every Sunday, Pastor Jimbo will invite the children (Kindergarten-3rd grade) to the front of the sanctuary for a Children’s Moment. During this time he will share a short story and message with the children. When this moment is finished, the pastor will release the children to go with the Children’s Church leader for the remainder of the service. We do celebrate the Lord’s Supper or Holy Communion at Andrew United Methodist Church at the discretion of the pastor. Aside from a traditional Christmas Eve communion service and one during Holy Week (leading up to Easter Sunday) there are no set dates for when this will take place, but we try to offer the Lord’s Table once every other month during our regular Sunday morning service. Our denomination offers communion as an open table to all believers. You do not have to be a member of the church to participate in communion. Our process for communion does not pressure anyone to participate, it is a personal decision for each individual and you may simply remain in your seat if you do not wish to partake.